12 weeks ago, I set a big personal goal to compete in my first Triathlon event (this Sunday). That was a big goal for me as I swim about as good as a dead fish… but you know what? -And I feel more confidence from training 4-5 days a week with a personal trainer for the past 2 months. Your success in life or in Article Marketing is cumulative. Each success builds on the next and when you are persistent day after day, week after week, month after month… your results begin to stack up in your favor. Set your Article Writing & Marketing goals BIGGER and I guarantee you’ll see bigger results! 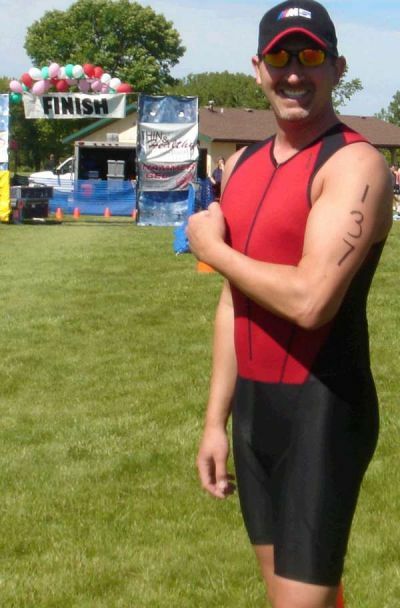 For the TRIATHLON, I cross trained in the gym, on the bike, in the pool & lake and local 5-10k races. My trainer was hired to be part of my team to help me achieve this big goal. For ARTICLE MARKETING, your training begins with setting a big goal, doing research and executing the plan yourself or with a team of writers that you assembled to help you with your big goals. You can do it. :) Be consistent and go for it. Remember, your results are cumulative. Setting goals is what it is all about. If I didn’t set goals for myself I’d be never get anything done. Case in point…everyone thought I was crazy for rescuing a horse from a field with a glitchy right hind leg. They said she’d never be useful for anything. Through a gradual exercise program, proper nutrition, and lots of love, I now have a horse that is worth her weight in gold. It was only through consistent, achievable daily goals that it happened. The important thing is to take baby steps at first and then build upon those. Before long, you and those around you (animal, vegetable or mineral) are part of a dynamic momentum that keeps growing and succeeding. Congratulations, Chris! What a wonderful accomplishment. And very inspirational. Good luck in the triathlon this Sunday. Congratulations on your upcoming tri…I started racing bicycles at the age of 55, and now in my third season, I’m getting the handle on how to be competitive, push through the pain and achieve more than I ever thought I would. You’re right with your comparison to writing or anything else we do in life, set the goal, make it bigger than you think you might be able to accomplish, but make it achievable and go for it, you never know what you are capable of until you try. I’ve actually done what Ed Weiss suggested above and set 100 articles as my goal; I’m at 20 in my first month, so I should make it by the end of September. Be sure to let us know how your fare on Sunday, and good luck! Congrats on your first 20 Keith! Yeah, I’ll post a photo on Sunday or Monday after the event. I also have a 10k run competition scheduled for Saturday AM as a warm-up for the tri. Good luck, Chris, and have fun!! 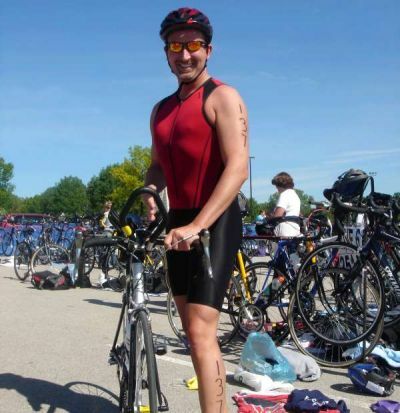 Congrats, Chris and best of luck in the triathlon… this is a fine, inspiring post. On SMALL GOAL scale, I know how you must feel. No, I’m no triathlete, but I lost 17 pounds because I did something I thought I’d never do again… RUN, Forest, RUN! Best to all for believing and achieving. And Pamela, congrats to you for giving life and purpose back to that beautiful animal. Let’s all write an article about goal-fulfillment this very day… what do you say? Thank you so much for sharing this story. You have a lot to be proud of. Sending you good wishes for your first triathalon. Have fun, enjoy your accomplishments, and keep setting goals that are challenging. Way to go Chris! You should be proud of yourself. It’s no small feat to run a tri – at any age so I applaud you for having the discipline and courage. Thanks also for the useful reminder about goal-setting. It’s too easy to get lost in our daily grinds and lose focus on the actions that move us to where we want to go, like exercising and article writing! Thanks to everyone for their ‘well wishes’ on my first Triathlon. I can now say that I’m an amateur triathlete. :-)… for however long that lasts. Feels great to be in shape… and makes the long 10-14 hour days in front of the PC more enjoyable. Way to Go! It always feels so good to get your first real race uder your belt…you look in-shape and happy, life’s two magical components. Keep it up, you don’t know where this will take you or what you will accomplish. Is there an Ironman in your future? Working the Knight shift, eh? Excellent indeed. Way to Go! BTW- did you write an article for the “Triathlon Category” yet? How about Goal Setting category? Keep up the great work, staying in shape is smart. And do not worry about the swimming, that will come with time, perhaps a lesson or two might also help. In the shorter triathlons; the person who gets out of the water first can really make time. Also during the running phase lean forward more and move those arms. Great Work Chris! The Knight in Shinning Bicycle Shorts! I didn’t write any Tri articles yet, but several have been in my head. I’m only using the triathlon and a few dualthons to cross-train for Racquetball. I’m femi ajayi , a nigerian. I’m a writer but i’m not yet published in any way…I have a passion to make my work known around the world…i want people lives to be blessed greatly through my work,pls help me achieve this dream…in any way you can. For the fun of it I set out to write 100 articles between Friday at 5 pm and Saturday at Midnight and I was able to pull it off and accomplish that goal I set. Then Sunday I rested and it was good. My comment is that it took me 3 hours to load the 100 articles on Sunday evening, which was kind of a bummer and I thought? Wow, you know in 3-hours I could have written between 12-15 more articles and thus I was concerned with time management as well.